On the one hand, I'm excited and interested in reading this book. On the other, can you recommend any other good authers that would be suitable for a non-academician or philosophy student covering some of the same topics that Dr. Hahn covers? I've read most of his books as well as a few by Jeff Cavins, Patrick Madrid, Keating, and Kreeft. But if I want to broaden my horizons, what other contemporary authors should I be considering? For a philosophy student, the sky is the limit - most philosophy students are superior academicians to English, History, or Social Anthropology graduates. Scott Hahn covers an extremely wide range of topics: what are you looking for? Biblical theology (which he teaches)? Apologetics (which most of the other authors you listed are)? Natural theology? (which is a requirement for most apologetics work)? Sacred or systematic theology? New Testament studies? Patristics? Protestant or ecumenical work? Traditional or liberal? That is, in which way do you wish to broaden your horizons? In terms of subjects studied in number (i.e. every Kreeft, Plantinga, and William Lane Craig book you can find), in terms of subjects studied in depth (ditto, plus supplementary study of their arguments and sources), or in terms of subjects studied by viewpoint (i.e. the Summa Theologiae followed by God Encountered and the nigh-impossible Trilogy, or the Holy Father's exegesis followed by Raymond Brown's)? Wow, this looks like a great book. 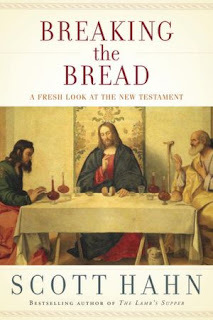 I'm a fan of Hahn's other work on the Sacrament of the Eucharist, so this is going to be a must-read for me. The linking of the idea of the "New Testament" with the Eucharist is a beautiful one. You have given me much to think about! I appreciate the questions. I am currently reviewing 3 books, and they all interest me in different ways: Called to Holiness by Ralph Martin, In His Spirit by Fr. Richard Hauser, and The Gift of Faith by Father Tadeusz Dajczer. I believe they have a common theme! I am enjoying reading the different authors. I would say that I am most interested in Biblical Theology authors, and less so Apologetics at this stage. I also would like to study the early fathers, but the "only" resources I have are the actual works or summaries that don't leave me feeling that I know any fathers well. Tim - if you could "ping" Chrysostom to let him know I respondend, I would appreciate it.